In This Episode: The new schedule is one new show a week, at least. We had a UDP DDOS attack this last week which was annoying. 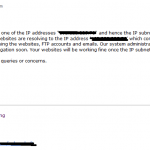 Here is the e-mail we got from our server guardians. Just click on it to see a larger version of it. So, this week, here is an episode of Musical Rations. This one is new and it is quite fun and poppy! Get some of that energy flowing! We have some stuff for the next Radio DMG up and ready to go, but we’ll put it up next week. EDIT: It has come to our attention that one of the tracks in the mix has content that may be considered objectionable. So, an edited version of this track is available right here. The track above is uncensored and the M4A is also uncensored. M4A in a ZIP (60MB): Squish it down by the guts! I guess we get attacked because we have opinions? No, it’s probably to stop the beat. This entry was posted in blogspam, musical rations, Radio Dmg Shows and tagged animation, big hero, chiptune, disney, goodness, legend of zelda, music, musical, nintendo, rations. Bookmark the permalink.